Stylus Hunt (originally known as Pushing Buttons) is a microgame found in WarioWare: Touched! in the Retro Action stage, and returns as one of 9-Volt's microgames in WarioWare Gold. 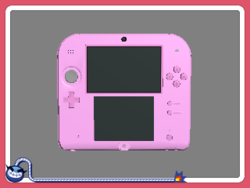 It involves the handheld consoles Game Boy Advance, Game Boy Advance SP, and Nintendo DS in Touched!, and various Nintendo 3DS consoles in Gold. The object is to press the indicated button (the button with the red circle) to make Wario appear on the screen in Touched!, or to find the stylus in Gold. The player has eight seconds to search for the button/stylus. Level 1: The button is already shown. Level 2: The button is hidden, but easy to find. Level 3: The button is well hidden and hard to find. Level 1: The front of the system is shown. Level 2: The back of the system is shown. Level 3: A random angle of the system is shown. This page was last edited on September 24, 2018, at 21:48.